Cate McLean, one of my roommates from college was here for a few days last week. 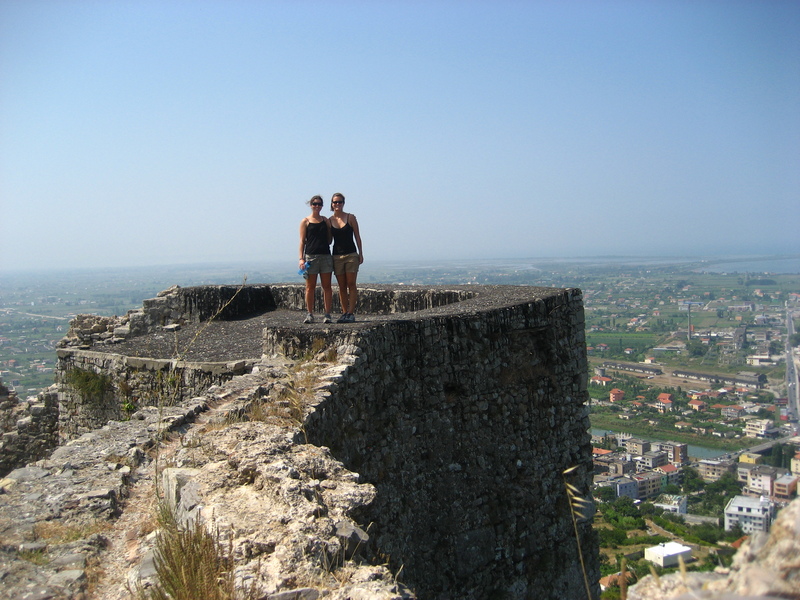 It was great to show her around and see Lezhë through a fresh pair of eyes. Even though I haven’t really been here for too long, there are some things I definitely am getting used to and don’t think about as “albanianisms” anymore. After a few days she took off for the north to such classy destinations as Croatia and eventually England, but not without braving the beach at Shengjin and getting to check out our castle. Amid the sweat, wet and heat, work for most PCVs has recently died down to a trickle. 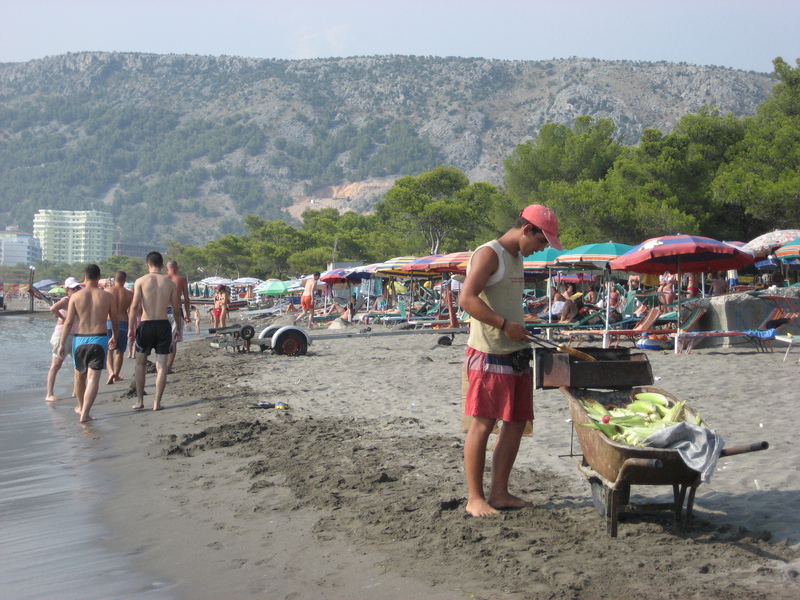 In August the entire country goes on “pushim” (vacation) and the beaches around Lezhë are daily packed with more and more sunburned people. However, for me it seems that work has just started to pick up. While my counterpart, Yllka was gone on her honeymoon I started working with a few guys in the Bashkia’s development and waste management departments on some IT projects and presentations for a local government best-practices competition sponsored by the Swiss Intercooperation. Then, my counterpart came back from her honeymoon last week and we have started to finalize plans for her big summer project – a camp for children living in poverty in Lezhë. All of a sudden I am busy and find myself thinking back to various camp experiences of my own and comparing them to what I know about camps here. Planning for this summer camp has been a long and frustrating process. I came in in the middle of things in late May and thought that pretty much all the details had been worked out already. Boy was I wrong. In May I understood that my responsibility would be to help Yllka plan and then work at the camp itself as a counselor-type with a few other PCVs….and this is basically correct. However, the planning stage has been more of a complicated process for all involved than it would have been in the US. My counterpart Yllka is working with a partner organization from the UK that owns the property where the camp will take place. What she has done so far has been to identify eligible kids and convince their parents that this camp is a good idea (not a small feat because it is very difficult to convince families that don’t have much to trust their local government office enough to let them take their kids away for a week) as well as communicate to the partner organization when and how the kids will arrive. At the beginning of the summer we were planning on having two one-week camps – one in July and one in August. In true Albanian fashion, this plan soon changed. Sometime in mid-June we discovered that the camp in July would not be able to happen since we did not have enough kids signed up (only 20-some) and the partner organization had way more demand for their facility than they ever thought they would – summer camps are a new thing here in Albania and are gaining popularity quickly. When given the opportunity to take a paying camp customer (such as an international NGO), they went for it and cancelled our camp. After changing the date once, parents kept coming into our office full of questions and concerns for Yllka. It was a mess, but the dust settled and we started planning in earnest for the camp in August. Then, yesterday, we encountered even more stressful problems. At the last minute (the camp is supposed to start on August 1 and we have 60 kids signed up), the director of the camp facility invited us out to the space to have a look and get to know the area before the kids come. He also used the opportunity to let us know that he had double booked the week we were promised with another camp group (he originally thought there would be few enough kids that the two camps would be able to happen at the same time no problem) and that we could not have the camp at that time. Come to find out later that the real reason we could not share the camp with this other, paying, organization is that they did not want their kids sharing the camp space with kids who are Roma or lower-income. So, our camp is now only going to be four days and was moved to another week in August. I found it infuriating that after all the planning and months of collaboration, this only came up now at the last minute AND that because of the camp director’s misguided assumptions and a bit of a language barrier between him and my Albanian counterpart, we now have to scramble and let the parents know and hope that they will still let their kids come. I am just happy that the camp will happen at all. So starting the 5th of August I will be hanging out at camp for a few days…should be an interesting and stressful and fun and crazy and shqip-tastic experience. I’m excited about the fact that the site has both a climbing wall and a pool…these are some lucky kids…! Sounds like you are really learning some negotiation and patience skills! Good luck!! !